I have mixed feelings about this truck. I'll start with a pro - the amount of food you get makes this truck a good value for the money. I got 1/4 white meat chicken which came with rice and a side for $10.00. It was filling and a large portion. Sadly, the remainder of my feelings lean towards the con side. The chicken is tender and moist but almost flavorless. If it weren't for the BBQ sauce (which is more of honey mustard than a BBQ) the chicken would have no flavor at all after the skin is removed. This is only exacerbated by the lack of flavor in the accompanying sides. The basmati rice was cooked nicely - not undercooked or mushy - but not seasoned at all. The garlic and butter roasted corn tasted like frozen corn cooked in the microwave. The guys running the truck were very friendly and provided fast service but didn't use any gloves when handling the food and were sweating profusely (yes I know its summer, yes I'm sure their equipment is hot but I don't think a headband or bandana would hurt to keep the sweat from potentially dripping in the food.) I tried this truck based on all the other good reviews it got but I don’t think I’ll return. Love the pulled, chopped chicken with chopped fresh veggies and roasted corn on rice. Great portions of chicken. Very flavorful, juicy and fulling. Loved the corn and the rice, although white, was still very good. The bbq sauce had an interesting flavor to it, great addition! I have never seen the actual rotisserie machine on a food truck before. It must be hot back there in the truck. But boy is the food good. Flavorful chicken, salad was well seasoned. Even the rice, I though it was just plain rice but they must put something in there while cooking it. People are friendly and very careful to make sure they give you exactly what you ordered. the BBQ sauce has a nice kick to it. This is the best combination of taste, portion size, and healthiness I have ever had from a truck. 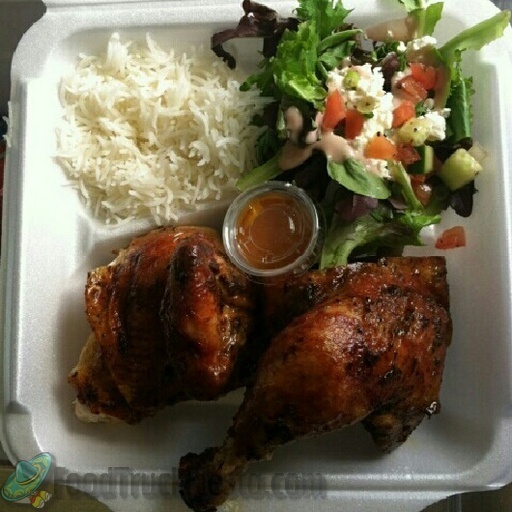 As other reviews have said, the chicken itself was crispy, juicy, and flavorful. The rice was pretty good and the side salad with lime dressing was nice and light. Overall, a really great value.. hope to see them back in Chinatown soon. The chicken was juicy and cooked thoroughly. Their BBQ sauce is the best and went well with the chicken. It would have been nice to have napkins or even better a wet nap. My lunch was excellent today. The chicken is perfectly seasoned and juicy. The corn was very tasty. The Bar-B-Q drizzle for the chicken was very good. My lunch was excellent today. The chicken is perfectly seasoned and juicy. The corn was very tasty. The Bar-B-Q drizzle for the chicken was very good. I'm a very hard person to please when it comes to food and these guys did a great job. They're very pleasant and very handsome too! I'm looking forward to this truck from here on out. WOW! Love it. I had the 1/4 white meat, which was miraculously tender and juicy; rice, which could use something -- it was just plain rice; and the heavenly basil cole slaw. Even though I'm stuffed, I'm thinking about going back out and getting more! I loved it! I've eaten here a few times...after the 3 week furlough I was happy to see what I thought was my favorite truck (Bulgogi)...but Ooh Dat was right there and I guess I now have a NEW favorite truck...given a choice between Cathy's and Ooh Dat...I pick Ooh Date...Chicken is perfectly seasoned and perfectly cooked and that sauce is amazing. 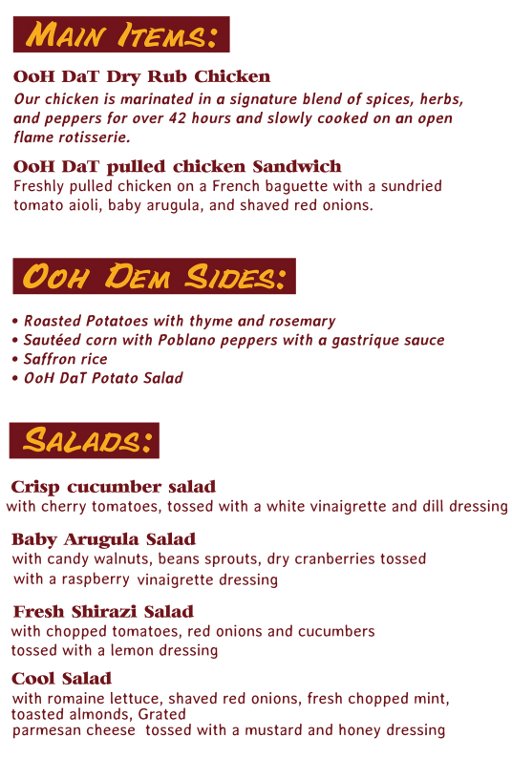 This was my first visit, and the truck was not on your list at this location so I did not intend to go; but when I saw 1/4 dark rotisserie chicken and fresh healthy sides I was hooked. The food was perfect. Everything was fresh, cooked just right, and delicious. I got the coleslaw as an extra side because I could not imagine what it would taste like, but it was great. 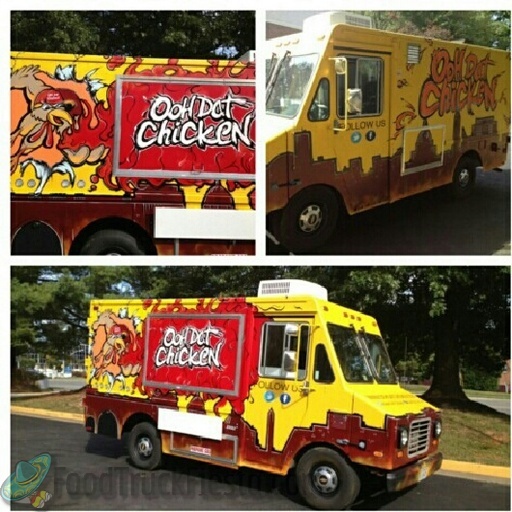 Ooh Dat Chicken is DC’s first rotisserie chicken food truck. 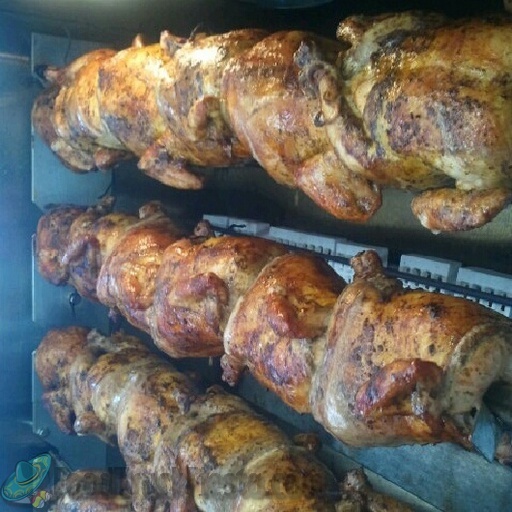 They offer the finest flame broiled rotisserie chicken with fresh local ingredients, marinated in their signature blend of spices, herbs, and peppers for over 42 hours. They use the low and slow cooking technique which makes the chicken unbelievably juicy and very flavorful. They open on Sept 25, 2012!